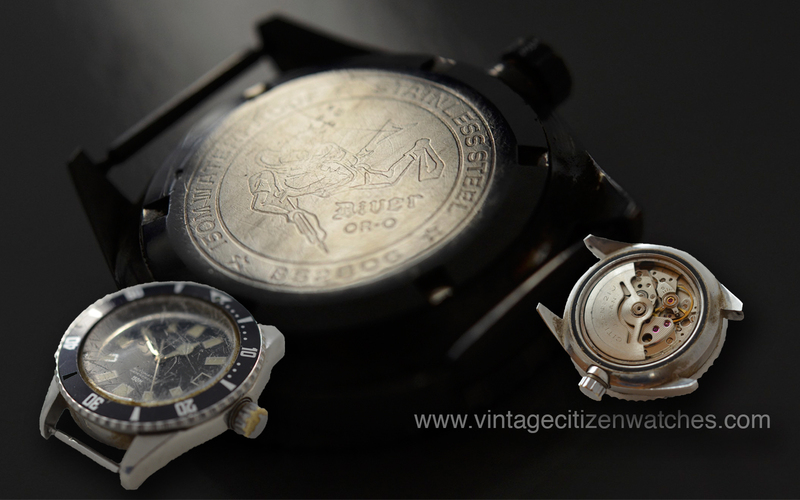 No Citizen collection can be considered a real collection until a 150m diver is included. 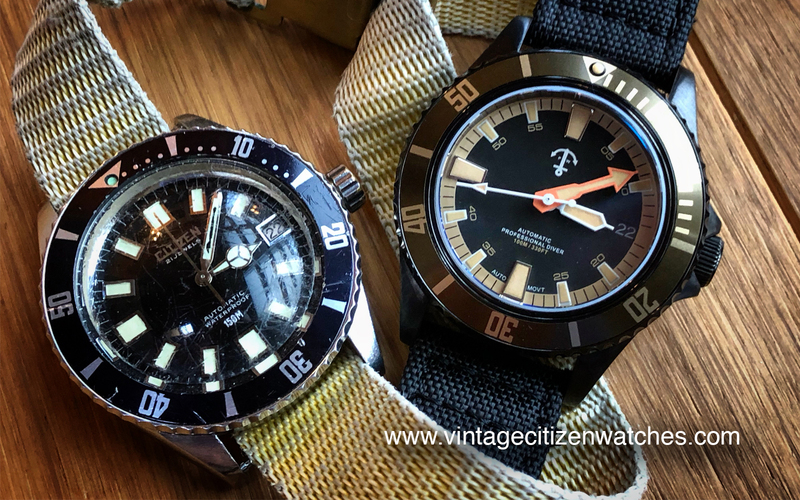 This is the most recognizable diver line in vintage Citizen so sooner or later for sure one model will come up for sale, just in time for you to grab and never let go. In fact there are 7 different models that to the untrained eye look almost identical. One for every day of the week, I would say. Well.. now that you have one, you will soon feel the urge to get another one and another one, and then a better condition fist one, that you already have, and another one. Without even realizing, it soon becomes an obsession, to have them all, and to have them all in top condition! The hunt is on! So, it is my pride and joy, my pleasure to introduce to you the entire 7 watches collection! Citizen Super Auto Dater, SADS 52801-Y was made in June 1967. It is my favorite. What is there not to like? It has a unibody case (the case back doesn’t come off), it has a top of the line 39 jewels Jet movement, calibre 1150, (read about Jet movements HERE) and it is marked Professional Parawater. The crown threads are on the outside of the crown tube. The case is shaped differently and it shows that a lot of effort was placed into designing and producing it. I just love the angles and the contrast between the brushed and the angled polished surfaces. Read about this model HERE. Is is on a Tropic strap. I didn’t see any on bracelet. I hardly saw any at all in fact. 🙂 Super rare! 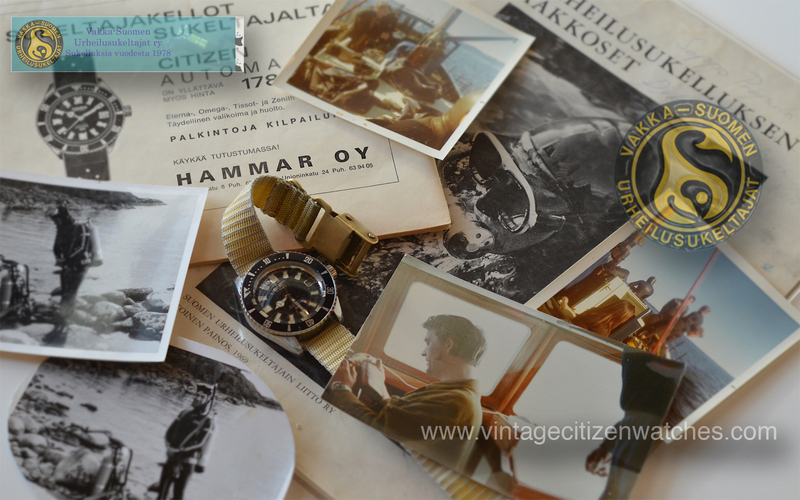 Citizen Crystal Date, AUDS 52802-Y OR-O was made in 1968. Did you ever see a better case back? Maybe you think you did, but take a look at this one! I am sure you will love it! The hands are different then the rest because there is no “Mercedes” style hour hand. The mesh bracelet is awesome, the crown is as it is for the first model and starting with this model the top part of the case has now a circular brushed finish rather then a longitudinal one. The uni case was dropped and starting now the case back screws into place. Starting with this model the Jet movement was replaced with a centrally mounted swinging weight. This one has the most beautiful aged lume. Read about that HERE. The movement is the Citizen automatic calibre 5410. Citizen Diver OR-O B52806 or 62-5370 are the same model but the first one is the one to have, because of the beautiful engraved case back. The 62-5370 is made for domestic market and the B52806 for export. They have different case backs, different hands sets and dial codes even though they share some of these features sometimes. The second hand tip received a luminous ball for better visibility (The 62-5370 can be found with a simple second hand too) The only thing that is constantly different is the case back. The movement is Citizen cal 5470. I had to chose between these two and I decided in favor of the first one. You can’t beat that awesome diver engraved case back! It is marked water proof in a period when the term Parawater was about to… unfortunately disappear. Is was made in ’69-’70 but the exact period is impossible to determine because it has no serial no. The 62-5370 on the other hand, has one and the manufacturing date can easily be seen. Read about these two variants together HERE. 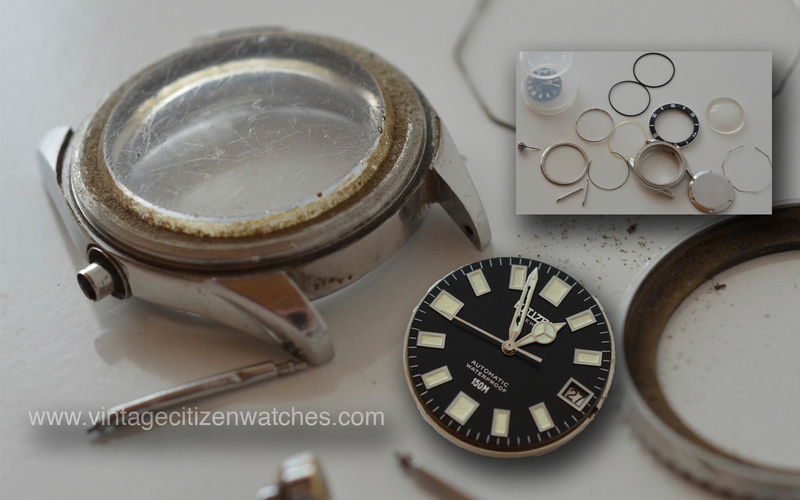 Citizen 150m 68-5372, 4-740131-Y is made in May 1971. It is still marked “parawater”, for the last time in this line. Read about “parawater” HERE. Starting now the case is different again and the crown has the threads on the inside, not on the outside of the crown tube. It has a different shape too and it is made in stainless steel. The previous ones I think are only capped in SS. And this is when the case backs became… well… displaying a lot of information but… boring. It is powered by Citizen calibre 7470. Citizen 150m 4-722410 Y is made in October 1973 and is the only one displaying the date as well as the day of the week. The movement is from the leopard family, calibre 7200. That is always nice to have. You can read about it HERE. The bezel insert got a thin crystal layer on top of the luminous dot making it more resistant to water and normal usage while giving it a special look with a black ring around it. The sweeping second hand is straight again. And, as I said before, no more “parawater”, time for internationally common used “water resistant”. 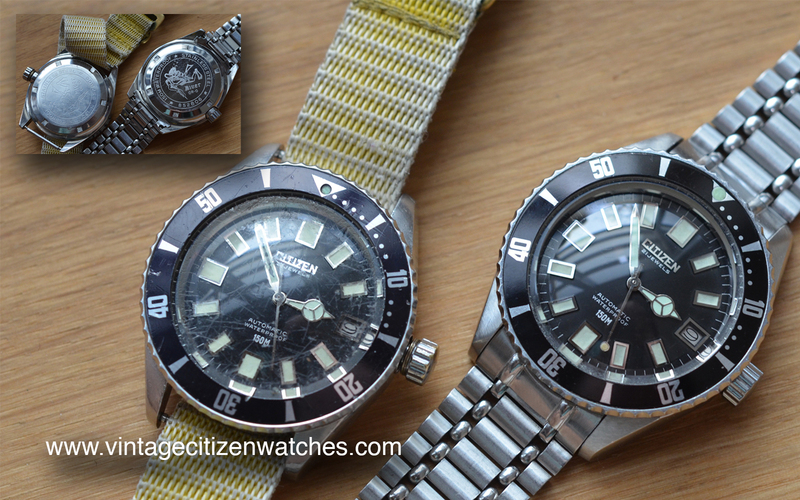 Citizen 150m 62-6198, 4-600851 Y is made in June 1974 and got a luminous marker near the date window. Pay attention to the fake “aftermarket” bezel inserts that you can learn about HERE. The date can be printed in red and the rest is, more or less, the well known design we grew to love so much. The bracelet is the H style links. Read more about it HERE. The movement inside is the Citizen calibre 7000. Citizen 150m 52-0110 is one of the very first Citizen watches I had. It is in fact my birth year watch and my month also. 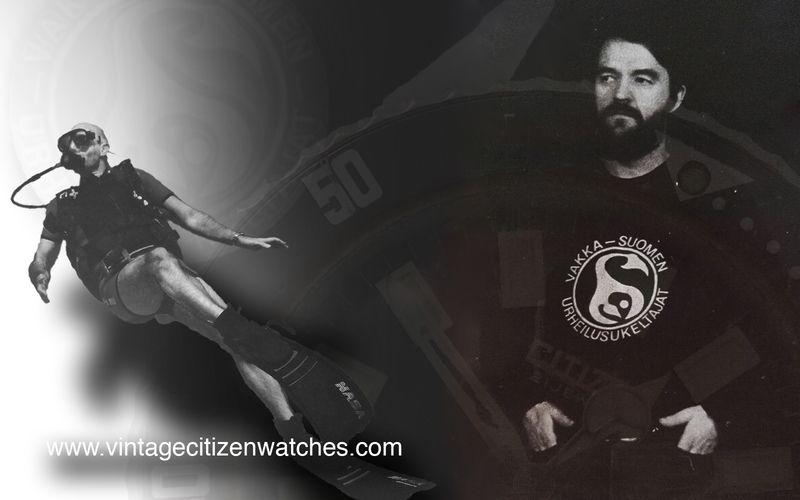 🙂 It is made in July 1978 and marks the end of an era, 1978, the last year for vintage Citizen watches. It is the the one that started this hunt a few years ago. It comes in various forms, even with an orange dial, maybe blue one? maybe an orange dial and blue bezel insert? (I think the “blue bezel inserts are in fact faded and originally black) Two dial variants 1977 and 1978 that you can read about HERE. You can also read more about this model HERE. The beating heart is the well known Citizen calibre 8210. And… the rest is history. 🙂 I hope you found you perfect 150m diver and if you didn’t, don’t give up, I promise you you will love it and the wait is worth it! 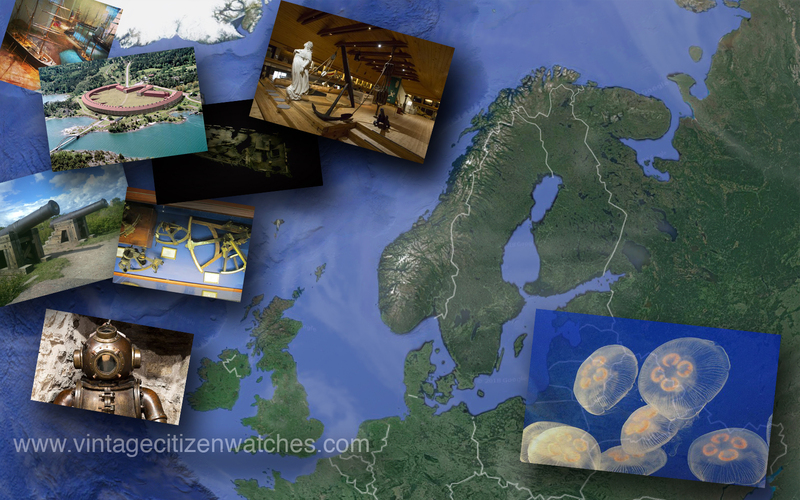 Read more about other awesome Citizen divers HERE.